‘Ganskweek’ poisoning cases in Angora goats in the Eastern Cape are uncommon. 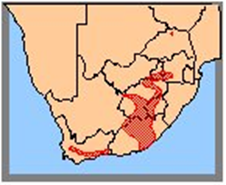 Cases have occurred in Post Retief (Emslie family farm) where deaths have occurred in adult goats diagnosed by Dr Steve Cockcroft. Poisoning in cattle has been reported in Graaff-Reinet, Molteno and Bethlehem districts. The liver and respiratory systems are primarily affected by the poison with a toxic principle a furanosesquiterpenoid. 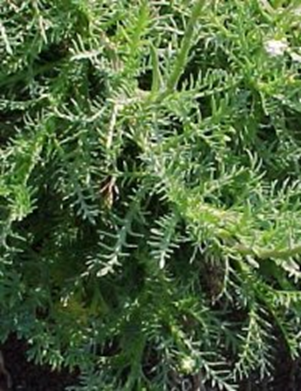 The plant ‘Ganskweek’ is abundant in late winter and spring when grazing is sparse. The Angora goat poisoning occurred with the first flush of green in early spring or even late winter. The goats, due to the dormant winter, end up eating the green Ganskweek. The Angora goat being a browser seems to be more susceptible because the ganskweek seems to be protected from the frost in the deeper wooded areas. Poisoning also occurred on the lands as the plants became present on the ridges. By the time the plants are noticeable they are less palatable and therefore less of a problem. The Angoras seem to avoid the mature plants and the smaller emerging plants seem to be more toxic. Whether the goats will get to know it and avoid it as with cattle, only time will tell. The goats were relatively new to the area. 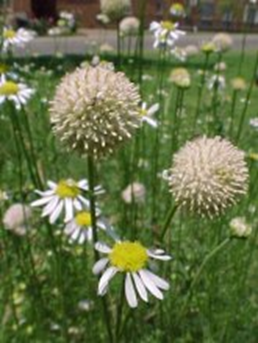 Ganskweek is a soft herbaceous plant about 40cm high. It has a stout woody rhizome with numerous stems. Leaves are alternate, crowded at the base. Seed: A round woolly puffball seed head. Seeds are woolly. Grows everywhere, but especially in vleis. Found in the Western Cape around Boland, Eastern Cape, Karoo, Free State, Gauteng and Mpumalanga. Not found in Kwazulu – Natal. Signs may appear 3 days after being introduced into a camp with ‘Ganskweek’. About 5% of the Angora flock were affected and died within 2 days. Foam at nose, marked inspiration and expiration. Mr Norman noted that if a fatal dose was not taken in the goats did recover but generally gradually deteriorated and succumbed to a cold snap (likely due to long term liver damage). Experimental poisoning in sheep caused deaths within 5 days and caused photosensitivity. Accentuated lobulation (dark red zones in most gives a mosaic appearance). Remove from camp and if possible place in shed or in deep shade with food and water. J S Afr Vet Assoc. 1994 Sep;65(3):122-4.